Ion-transporting materials are in high demand for a variety of applications, including fuel cell membranes, solar-fuels membranes, battery electrolytes, and transistors. For these applications it is desirable to create polymers that are both ionically conductive and mechanically durable. This can be achieved through a variety of methods, including chemical and physical crosslinking, as well as through microphase separated block copolymers. The Segalman group has designed new systems that combine ion conductivity with other desirable properties largely by incorporating ionic liquids into polymers with an emphasis on learning about structure–property relationships for the optimization of new nanostructured, ion-conducting membranes. Current work also focuses on the use of physical cross-links through metal–ligand coordination to decouple polymer ionic conductivity from bulk mechanical properties. Specifically, we are focusing on the ability to conduct multivalent species through the incorporation of novel ligand species. Through AC impedance, pulsed-field-gradient NMR, and rheology, we seek to measure local ion–polymer interactions and determine design principles for the efficient conduction of multivalent ions. Zero-frequency viscosity can be dramatically tuned in PIL-inspired polymers through the choice of metal cation species, while ionic conductivity remains roughly constant. Understanding these effects will lead to an improved mechanistic understanding of how ions move through these polymeric ionic liquids. The IRG-2 team will further impart functional properties such as photochromism, multivalent ion conductivity, redox activity, magnetism, and reconfigurability through design and exchange of ions. The IRG-2 team is interested in understanding the design principles governing a vast space of processable and functional PILs. 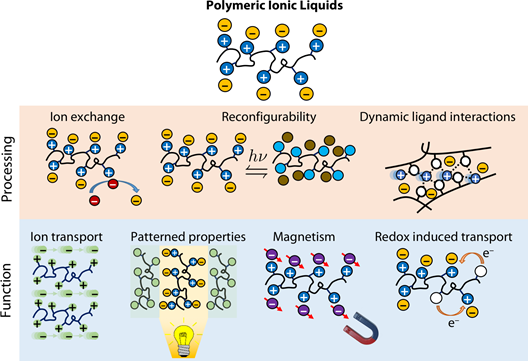 Click here to access a list of our publications related to polymeric ionic liquids.